achievement to this next level. to your success as a company that cares. – the ultimate accolade for making a positive contribution in corporate social responsibility. • TWO full-page full-colour advertisements: one on the CD and one on the website. 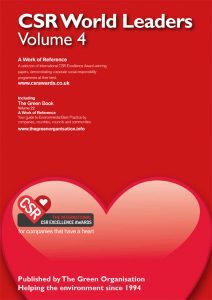 • TEN copies of The Global Guide to CSR Best Practice CD for your own reference or promotional use. • A personalised press release. • Personalised citation news release re. your CSR World Leader status. • Two trees will be planted in recognition of your double achievement.